There’s something magical about glow-in-the-dark stuff. Beyond the obvious “glow-in-the-dark” part, which is created by pigments that react in or out of sunlight to glow and create a vibrant experience with whatever you put them on. We’re sure almost everyone has had glow in the dark stars in their bedroom, or glow in the dark t-shirts – truly, anything you could imagine has been made available in various shades of luminescence. You can have the same kind of glow-in-the-dark effect that you loved as a child by adding a powder that contains the same pigments that cause planets and stars to glow on your walls. This is particularly crafty when you think of things that you could mix that pigment with. 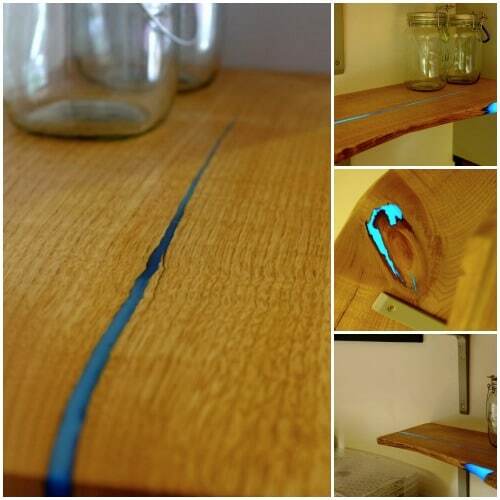 One creative idea that we came across consisted of mixing resin with glow-in-the-dark pigments to use to pour into the cracks of some cracked chestnut planks. If you’ve had to deal with lumber before, you may be familiar with the planks that are often left behind at the lumberyard. Usually, people can use a resin inlay to mask the cuts and breaks that form in the wood (and match the natural color of the wood). Resin inlay is an effective and easy way to make the wood more usable and to seal in the cracks and splits that might ruin the ideas you have for the wood plank you’ve discovered. However, this DIY project takes that one step further. With this fantastic tutorial, you’ll be able to see how to use glow-in-the-dark resin inlay to create a beautiful effect that will make whatever you plan to use the wooden plank for memorable. The tutorial offers great step-by-step instructions and detailed photos that will walk you through each of the steps so that you will be able to use this extraordinary magic glow in the dark resin inlay in no time at all. Consider all the things that you could build now with an extraordinary line of colorful and memorable resin laid into each plank and coming to life with various shades of luminescence in the darkest of nights. Shelves, dressers, bed-frames – the sky is the limit when you try this awesome do it yourself project.